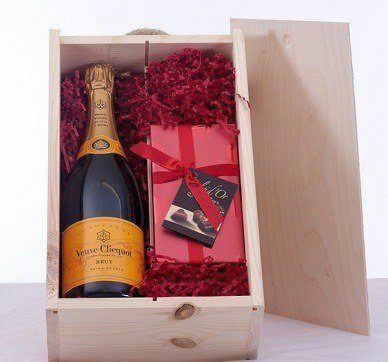 Chocs and bubbles is ideal for Veuve Clicquot Champagne and a 190g box of Luxury Belgian Chocolates packed in a wooden gift box. the NV Brut Yellow Label (an assemblage of 55% Pinot Noir, 30% Chardonnay and 15% Meunier) is currently based on the 2012 vintage and contains 35% reserve wines. On the nose, ripe and intense (yellow-fleshed) fruit aromas intermix with a very nice maturity from the reserve wines. Disgorged in January 2015 with a dosage of nine grams, this is a medium-bodied, yet round and full-flavored Brut. It possesses biscuit and nutty flavors, and a nice freshness and complexity in the intense, aromatic finish. Indeed, this is very delicate and impressively good.